Lynea Petty’s passion for food began as a child in rural northwest Ohio. Cooking was a family affair, with her father, a busy attorney, making homemade bread, pastas, and stir fries. As a French major in college, Lynea spent a semester on a rural French dairy farm, stirring up an interest in food production. In 2015, after completing graduate studies in conservation, she landed in the Wood River Valley for an AmeriCorps position with The Nature Conservancy. She went to work as Ketchum Farmers’ Market manager and shifted her environmental focus to food systems and supporting local farmers. 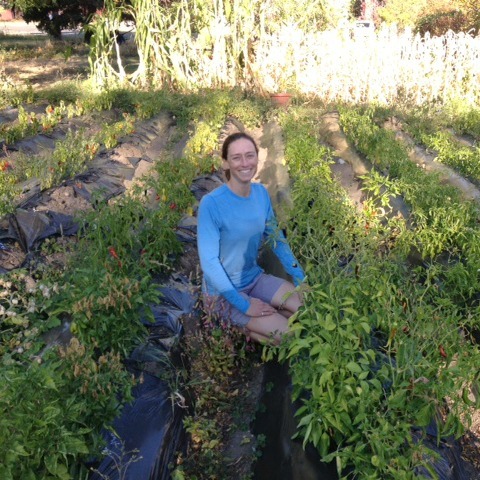 Later positions with Fair Mountain Farm in Fairfield and Idaho’s Bounty provided the ideal background for her current role as food production manager for The Hunger Coalition, where she spearheads efforts on Bloom Community Farm. Lynea’s impressive urban farm adjacent to her home in east Hailey is testament to her commitment to local food. My time as the Ketchum Farmers Market manager coincided with the time when I was looking to get more involved in community. The position offered me the opportunity to build relationships and learn a lot more about food production and the joys of intimate farmers market connections with the community around this inherent thing of being alive – eating. Also, my parents and grandparents always tended gardens. The values of connection to land and self-reliance were seeds planted at a very early age for me. Good food builds build physical, tangible health – healthy bodies, healthy communities, healthy soils and more. It is place-based for each body, patch of earth, each household and town. Good food is also a mindful action of building awareness in one’s connection and interdependence in being alive, as well as the generations to follow. All home gardeners. The everyday people who commit to the challenges and inspirations of growing some of their food. I am inspired by the big thinkers too, but my neighbors and others right here in the Wood River Valley are that deeper well for me. Right now, pasta dishes complimented by home garden veggies. Making pasta by hand is something my family did growing up on occasion. It creates fun evenings around the table, and the fresh garden veggies from our garden plot add indescribably to the tastes and group experience. I believe in the intentions, and am somewhat frustrated with the more onerous ways the official certification can complicate a farmer’s daily grind. I believe in getting to know farmers. Are you concerned about GMOs? If so, why?I am concerned about a fair number of aspects to our food system whose long-term repercussions are largely unknowable. For example, we are all in a huge experiment with regard to plastics in our lives. For GMOs, amongst other things, I am concerned about the concentration of ownership amongst the seed supply. Food is a basic need, and to me a basic right. I do not think it wise to keep increasing consolidation and protective patenting in this basic resource for humanity. What do you hope to accomplish as Blaine County Community Food Assessment manager?This assessment empowers our community to combine data with passion, and continue the journey towards thoughtful change in our food system. I hope to facilitate constructive collaboration amongst organizations, as well as inspire a larger portion of our community to engage on all things food – this is about building community layers at a time. To be more specific, one dream I have is to facilitate vegetable production for local consumption, with innovative land access and farmer mentorship programs. What’s your end goal or what impact do you hope to have in terms of food?I hope to build community. As much as I long for health and environmental awareness and action, among other things, I hope most to engage people in this community. Having faith in each other, and acting together is fundamental for our progress together. What is your biggest wish for food system change?I have all sorts of hopes about policy, as that should have larger ramifications than individuals voting with their forks. But I also wish for individual awareness to grow. I wish for the concept of ‘food as medicine’ to be more prevalent. Not so that kitschy products can be developed in lieu of other types of pills; I hope for that spark for people that drives them to act with long-term benefits to themselves and their communities. What change would you like to see in the Wood River Valley area and/or Idaho in terms of food?My head is on the entire food system, and no one change will do, as everything is connected. I want to see a resilient food system. Nutrient cycles among farmers, crops and livestock that build soil, not deplete it; Irrigation practices and crop selection that work with our climactic reality; Nutrition as an Rx regularly prescribed in our doctor’s offices; Local marketplaces and consumers supporting local farmers, creating stable marketplaces right here; home gardens and community gardens. I am not so naïve as to think we can exit the world marketplace, but we darn sure can care about our home and invest in each other.